A bit farther on Rosine. I emailed the client for this portrait and found out that the horse is actually darker than the photo shows, almost black so I have added a few more glazes to darken up on the head. I believe I am about done there and will start doing the detailing that needs to be done on the head. I will be working on the body of the horse but want to keep the detail on that to a minimum so the head will be the center of interest. 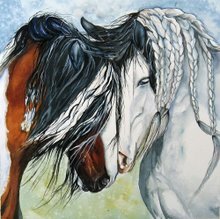 I am always amazed at your horse paintings. They look so life like.